Outdoor hot tub for 6 pers. and jacuzzi for 4 pers. Company’s recreational days for 10 persons starting 70 €/person/day including accommodation and an approx. 2-hour guided tour in the nearby nature. Aulanko Lake Villa is the centre of tranquillity with all modern comforts. Have meetings or go for a vacation and enjoy many activities around the year such as fishing, golfing, boating, sauna, swimming, snowshoeing, ice fishing and cross-country skiing. You can visit the Aulanko Spa or just enjoy the peace and beauty in your own pace. 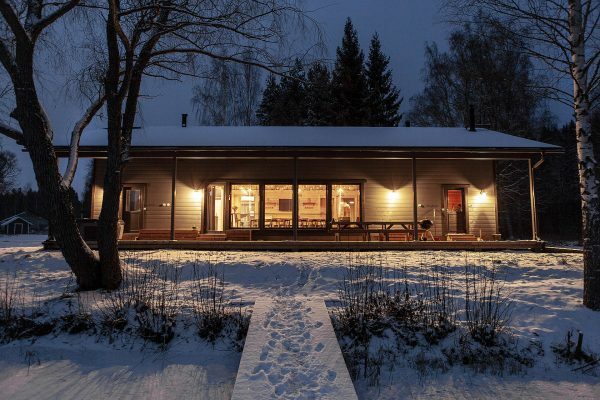 The unique multifunction villa is tailor-made for groups of 5–20 persons and is located in Hämeenlinna, Finland, surrounded by the national scenery of lake Aulangonjärvi. In the middle of Peace & Privacy yet just a stone’s throw away from the city centre of Hämeenlinna. 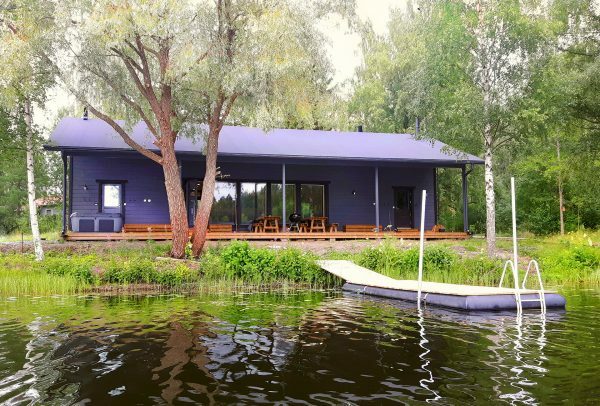 The 152 m2 Aulanko Lake Villa was completed in late 2017 and is located just 5 meters from the shore which means you can go swimming, boating, paddling and SUP boarding from the terrace. As for the winter, you can go for example, cross-country skiing or ice fishing. After an eventful day there is nothing quite like the sauna. With two saunas, one electric and the other wood-heated, up to 15 persons can sit in the saunas at the same time. And there is no need for taking turns if the ladies and gents wish to go separately. 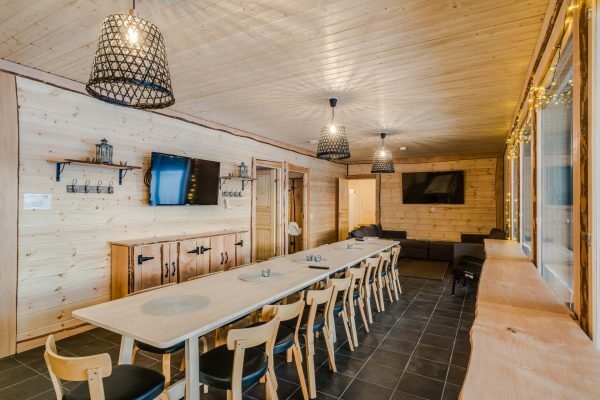 Despite all the modern comforts Aulanko Lake Villa has the feeling of old times Finland when the lumberjack still roamed the woods. This means no modern furniture, glass surfaces or white plaster walls. What you will find is an honest and warm atmosphere. The craftsmanship of the local carpenters is clearly visible in the rough decoration and strong furniture. View detailed floor plan. Main hall: The 45 m2 and almost 3 meters high dining/meeting room can seat up to 20 persons around the long dining table. The same room can easily be used as a sleeping area for up to 4 persons thanks to the corner couch. The 4G internet works swiftly and the big flat screen TVs can also be used as presentation screens. The dining area is connected to the big terrace with an outdoor sauna as well as hot tub. And of course, all of this is right next to the lake! Accommodation: All together there is a total of 15 bed places in 4 bed rooms and 2 convertible couches in the dining room. With an additional charge a separate cottage made for accommodation is available for 4 extra bed places. If needed, the total bed places can be expanded to 20 with extra mattresses. Kitchen: Tableware for 20 persons, an electric stove and oven, a big fridge, a freezer, a dishwasher, a microwave, a Moccamaster, an electric kettle and a toaster. 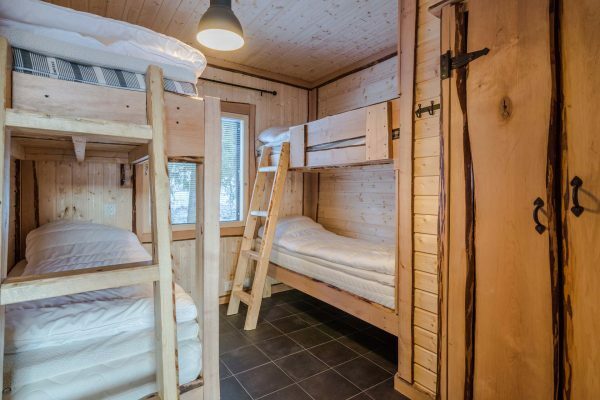 Electric Sauna, Showers and Bathrooms: The electric sauna of Aulanko Lake Villa has space for 8 persons at a time. There are 2 showers in the bathroom and the dressing room is connected to the terrace for quick cool offs from the sauna. Or you can jump straight to a warm hot tub if you like. The 3 bathrooms make morning routines easier and more convenient for bigger groups. 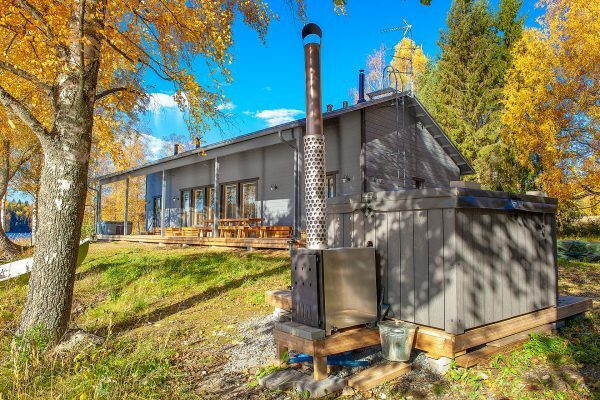 Wood-heated Sauna: At the other end of the villa is a separate wood-heated sauna with all modern comforts that has space for 7 persons at a time. The wood-heated sauna also has access to the terrace. Hot Tub and Jacuzzi: The wood-heated hot tub is located next to shore and is connected to the terrace. You can access the hot tub from indoors via the terrace while keeping your feet clean. A great chance to try ice swimming in the winter! A Jacuzzi is available in terrace around the year to relax and enjoy the lake landscape. Barbecue: In the yard area there is a robust charcoal grill (we kindly ask to bring own charcoals for it). 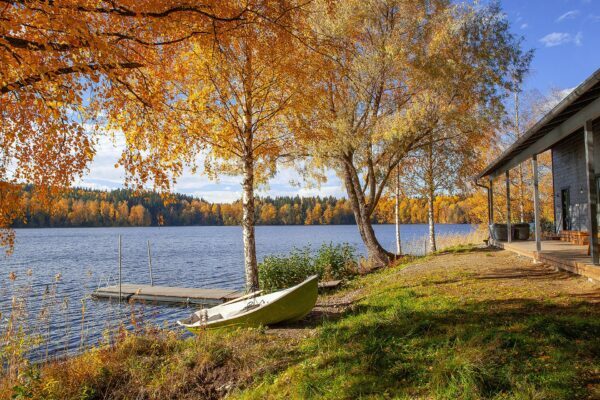 Fishing, Boating and Paddling: You can effortlessly go fishing, boating and paddling to the peaceful lake Aulangonjärvi right from the villa. Who knows, with some luck you might end up roasting some self-caught fish! And during winter you can go ice fishing, cross-country skiing and ice skating. Hiking trail: Near Aulanko Peace area there is an outdoor route where you can take a small hike during low snow season. A route map can be borrowed from the main building. The magnificent Sibelius Forest is also just a few hundred meters away! The price includes the air-conditioned main building with electric sauna. 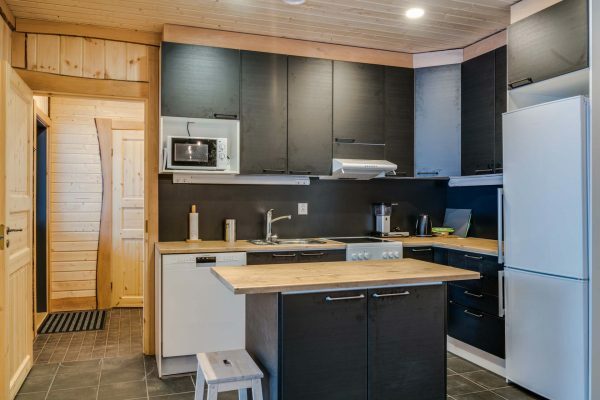 Additional services offer the use of the hot tub, wood-heated sauna, the accommodation cottage, the final clean-up, towels and sheets with the bed made or sheets as a stack. The wood-heated sauna and hot tub prices includes pre-heating only upon special request. Ask for an offer for Aulanko Lake Villa by filling the offer request or by contacting us via email info@peaceandprivacy.fi.